Some of the world's greatest explorers began their famed voyages into the New World from Belem. During Portugal's Golden Age, riches streamed into the veins of Lisbon through this port, which was guarded by the imposing Torre de Belem. 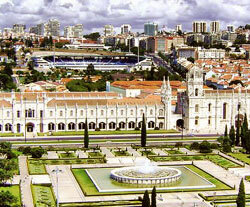 The fortress is still standing, as are most of the district's old buildings even after the Great Lisbon Earthquake of 1755, thanks to Belem's dense bedrock foundation. Belem's traditional residential neighbourhood is completely intact and is a testament to the city's idyllic past. A stroll through its narrow streets and tiny squares will bring a pleasant view of churches and whitewashed houses with wrought-iron balconies coloured by pots of flowers, drying laundry, and caged birds. The Jardim do Ultramar, a large tropical garden, reaches the banks of the Tagus River. The official residence of the President of Portugal, Belem Palace, is inside the garden. At the other end of the garden is the magnificent Jeronimos Monastery, the final resting place of kings, poets, and the explorer Vasco da Gama. Visitors to the area can get a bite to eat at the nearby coffee and pastry shops. The most famous of these is the Antiga Confeitaria de Belem, which has been around since 1841. The riverfront is also a pleasant area to take in the local flavour of this grand old city's sites.